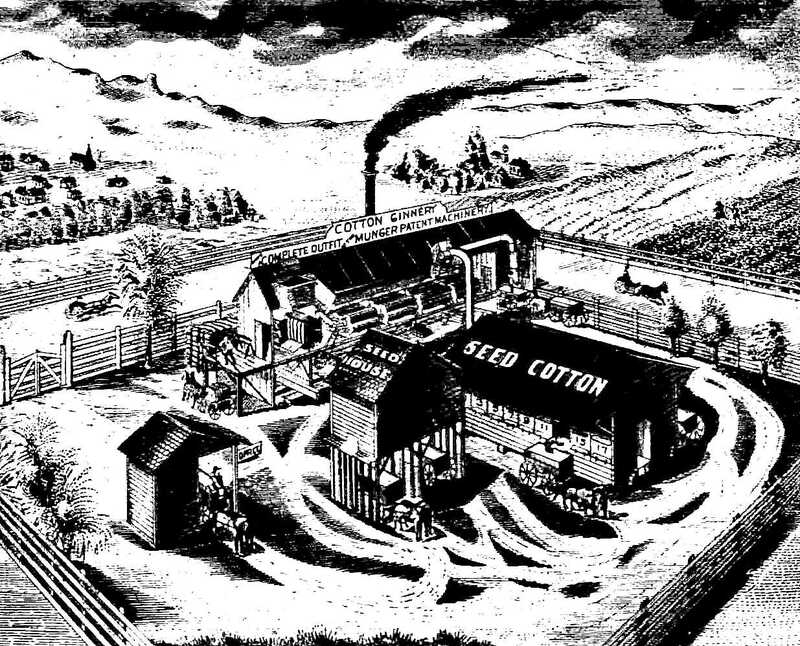 When R. S. Munger moved to Dallas from Mexia around 1885, even he probably had no idea how revolutionary his patented inventions would become to the world of agriculture — he had several patents, but his “improved” cotton gin was hailed as the most significant advance in cotton ginning since Eli Whitney’s original invention. 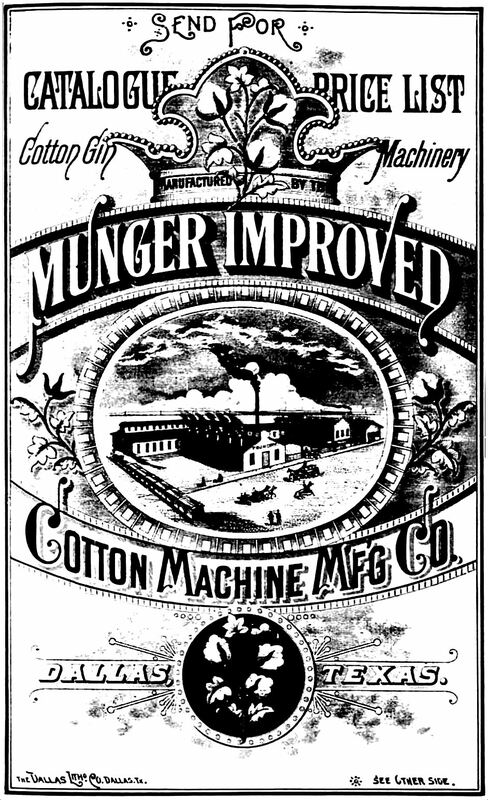 Munger had been producing his equipment for a while in Mexia, but he knew that in order for his company to grow, he would have to move to a larger city, one served by the all-important railroad. He arrived in 1885 and moved into an existing “East Dallas” building owned by the wealthy banker (and former cotton farmer…) William H. Gaston (who later became an officer of the company). Another article describes just what Munger’s “improvements” were and also has a description of his factory — the heart of which was a 25 horsepower engine (a quick Google search tells me that 25hp is the size of a standard outboard motor engine). 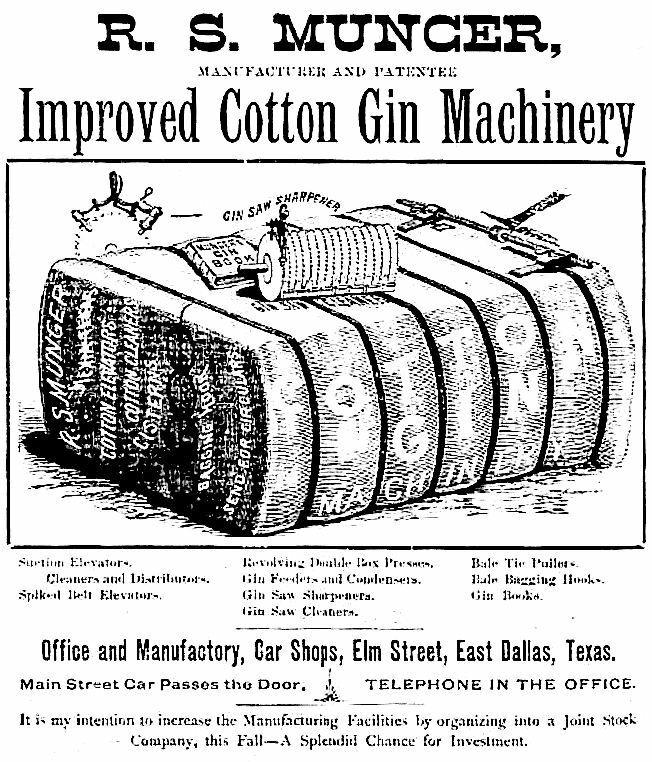 Fast-forward to today: the factory which Munger began in Dallas in the 1880s is somehow still standing and is known by most as the Continental Gin Building. 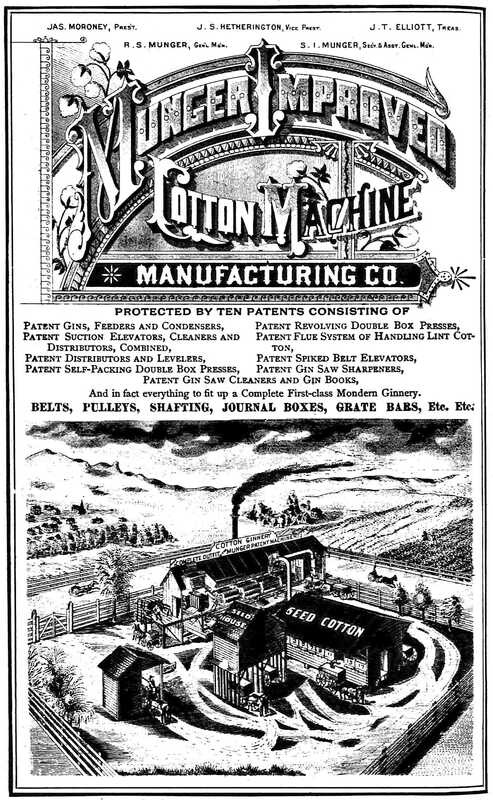 Here are a few very early ads of Munger’s cotton-gin-manufacturing empire, from city directories (the illustrated ads are full-page, which even in 1886 cost a pretty penny). Photo of Robert Sylvester Munger from Find-a-Grave. An aerial view of the complex of former Continental Gin Co. buildings can be seen via Google here. Thanks! At one point I was able to view the Bolanz block book maps on the DPL website, but I haven’t been able to do it (on any browser!) for probably at least a year now. It’s a shame, because those maps are incredibly useful. It’s helpful to remember that Munger’s 25 horsepower engine was steam, which is of the external combustion type. This meant it required a good-sized boiler, firebox, chimney, steam lines, and shafting to produce any actual work, to say nothing of water and whatever it required as fuel for its firebox. A modern 25 horsepower steam engine, complete with ancillaries, currently seen on You Tube will come close to filling a box car.